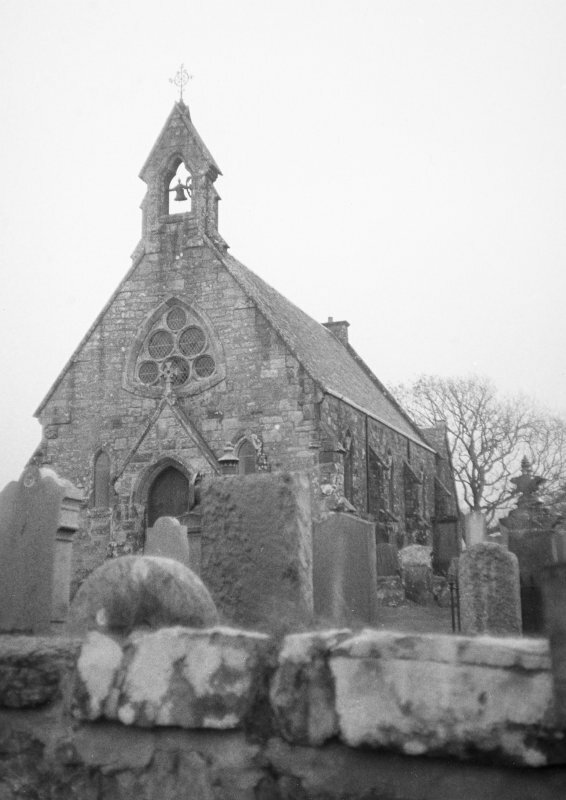 (NR 9634 2186) Kilmory parish church is modern. It was erected in 1785 on the site of an earlier church, added to in 1810, and completely renovated in 1881. There is some doubt as to whether this is the site of the pre-Reformation church or not, there being a site known as that of a St Mary's Chapel at Sliddery (NR92SW 10 ). There are no pre-1709 gravestones, but there is a stone font in the churchyard, which may have come from the old chapel (McArthur 1873). The font was found in draining the glebe land some years ago a little E of the lime kiln (NR 9617 2173) and near the S boundary of the glebe (ONB 1864). The building is consistent with a date of 1785, and nothing of an earlier period appears to be incorporated. The numerous pre-1785 headstones (one found dated 1706) testify to an earlier church on this site, but nothing of its history or tradition is locally known. There is no trace of a font in the churchyard, and the former minister (Rev B Fishwick, 8 Ladeside Place, Shiskine) here, does not know of its existence. Visited by OS (J R L) 28 November 1977. Reels 3 & 4 (Arran), accompanied by index on microfiche. NR 9635 2180 Evaluation was carried out in May 2006 in advance of a proposed new cemetery site, immediately S of Kilmory Parish Church. Ten trenches representing 12% of the entire area were excavated. No archaeological remains were discovered. Archive to be deposited in NMRS. Report lodged with WoSAS SMR and NMRS.